Ready to link-up your October finishes? And don't panic, link-up is open until 11:55 pm EDT on October 31! My goal for October was to turn a pile of fall themed hexies into a mini quilt. This is the first time I've assembled hexies together to make something. Once sewn together, I appliqued them onto the background fabric and did some top stitching on the hexies themselves and then echo quilting to finish the piece. 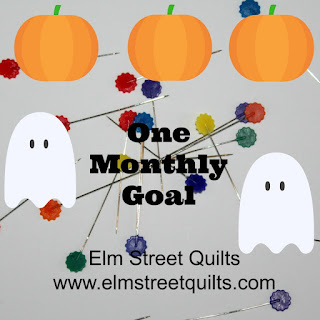 Now it is your turn to link up - share your goal finish for October. Please only link up if you finished your goal and if you also participated in the October Goal Setting Link-up. There will be three winners this month - Fat Quarter Shop is offering a $25 gift certificate, Make Modern Magazine is offering a 6 month subscription to their digital magazine and Lorna from Sew Fresh Quilts is offering three (3) pdf patterns from her shop. Congratulations to Nicole, Laura & Anita - our winners for October. I'll be linking up my hexie mini with Freemotion by the River, WIP Wednesday's, Let's Bee Social, Midweek Makers. Needle and Thread Thursdays, Finish it Up Friday and Finished or Not Friday. It looks like a hexie month for you and me. Very cute. The little hexies quilt is very nice. The fabrics and colors are very autumn. Congrats on finishing your goal! How cute! Wow!!! that is very nice, something for next year :-) making seasonal quilts and mini quilts. Beautifully done! Congrats on finishing off your October goal. Nice hexies for the fall! Thank you for hosting OMG! Thank you Patty - I'm so proud of myself this month - I actually met my goal!! I love your mini - the colours are delicious! I love your little hexie quilt, beautiful colours and so nicely photographed.